Henry, a carpenter by trade who was at that time thirty-two years old, was slight of build and no more than five feet five inches tall.2 Any further details of his encounter with the lodge members are unknown, including the identity of the lodge itself. The 1912 Sioux City Directory lists a number of “secret societies,” also known as fraternal organizations, located at or near Fifth and Douglas streets. The night of Henry’s encounter was a Monday, and assuming the locations and meeting times did not change between 1911, when the directory was printed, and August 1913, the only lodge meeting held on Monday nights at Fifth and Douglas streets was the Improved Order of Red Men.3 Why Henry was desperate to gain entrance to the meeting is anyone’s guess; perhaps he had a prior conflict with the organization, or perhaps he simply stumbled upon the meeting when out for a night of carousing away from the squalls of a newborn baby. 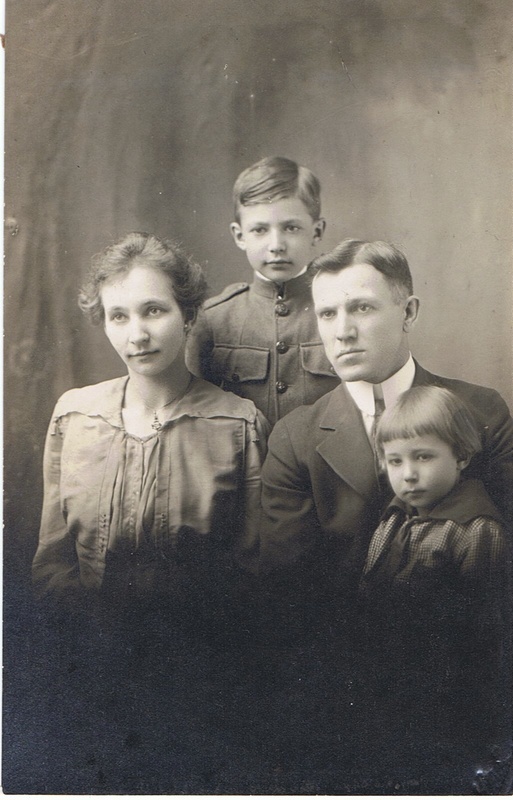 From left: Melanie (Lutz) Adam, son Gerald Joseph Adam, Henry Joseph Adam, and son Leon Francis Adam, Sioux City, Woodbury County, Iowa, circa 1915; digital image 2010, privately held by Melanie Frick, 2019. Copyright © 2019 Melanie Frick. All Rights Reserved. 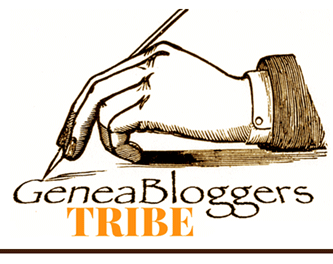 This entry was posted in Uncategorized and tagged 1910s, Adam, family history, fraternal benefit societies, genealogy, historic newspapers, Iowa, Sioux City on February 28, 2019 by Melanie Frick. Sioux City’s sole Danish church, located at 1113 12th Street, was organized in 1890, and met in a former Norwegian Lutheran Church that was moved to this site in 1892.4 While what may well be this original building, a modest one-story frame structure situated in a residential neighborhood, still stands to this day, it is now the Iglesia de Dios Evangelio Completo Pentecostes. At the time that James and Kathrine were married, however, it was home to a congregation of nearly two hundred and sixty Danish Lutherans, and it seems quite likely that it was through this immigrant community that James and Kathrine had the opportunity to meet.5 There is no known account of their marriage, nor any known photographs. 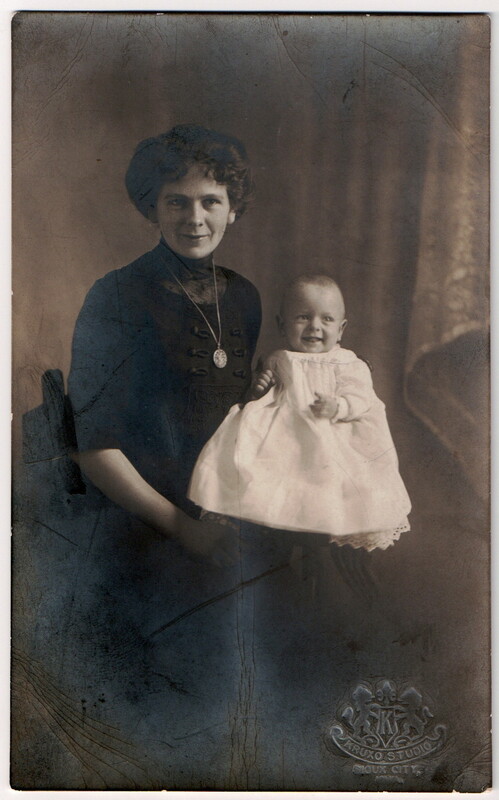 Kathrine (Christensen) Walsted and son Roy Walsted, Sioux City, Iowa, 1911; digital image 2010, privately held by Melanie Frick, 2018. At the time that James and Kathrine married, Sioux City’s population was nearly forty-eight thousand, and included a diverse immigrant population represented in its many foreign-language churches.13 For recent immigrants James and Kathrine, it must have been a great comfort to find there a close-knit Danish community that shared their native language and cultural heritage. Copyright © 2018 Melanie Frick. All Rights Reserved. This entry was posted in Uncategorized and tagged 1910s, antique photograph, Christensen, church, Denmark, family history, genealogy, Iowa, marriage records, Valsted, vintage photograph, Walsted on December 9, 2018 by Melanie Frick. 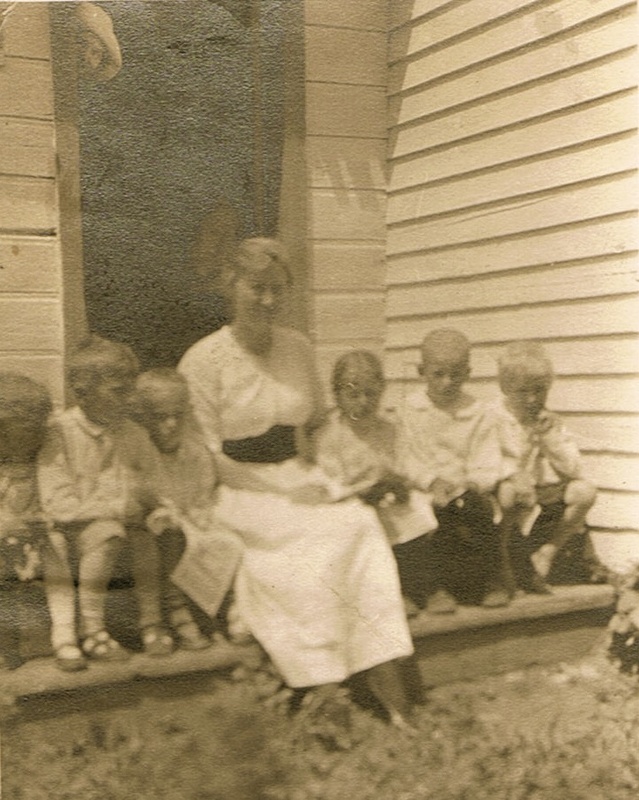 Andrea Nelson at a schoolhouse with her students, Yankton County, South Dakota, ca. 1916-1918; digital image 2012, privately held by Melanie Frick, 2018. This entry was posted in Uncategorized and tagged 1910s, antique photograph, family history, genealogy, Nelson, Nielsen, school, South Dakota, Spanish Influenza, teacher, vintage photograph on September 30, 2018 by Melanie Frick. Brothers Louis, Peter, Joseph, Prosper, and Timothy Adam(s), ca. 1913; digital image 2010, privately held by Melanie Frick, 2018. Image courtesy of Dorothy Bouchard. Timothy, at right, likely resided in Jefferson, Union County, South Dakota at the time this picture was taken,3 not far from Peter, second from left, and Prosper, second from right, who had both settled in Sioux City, Woodbury County, Iowa.4 Joseph, at center, had apparently traveled from his home in Ponca City, Kay County, Oklahoma to reunite with his brothers, as well as, undoubtedly, his twin sister, who lived in Jefferson.5 Louis, the one brother to have remained in Hampden County, Massachusetts, traveled the greatest distance for this reunion.6 The only living Adam brother not pictured here was Euclid John (1856-1940), who spent his adult life in Southbridge, Worcester County, Massachusetts.7 Whether he lost touch with his brothers or was simply unable to make the trip to visit them at the time that this photograph was taken is not known. The Adam brothers, some of whom adopted the surname Adams in addition to Anglicized versions of their given names, held a variety of trades between them. Census records indicate that after leaving the cotton mills, some went on to become carpenters, barbers, homesteaders, clerks, pool hall operators, and hotel-keepers, among other occupations. All married, and all but Joseph had children of their own. This photograph is a photocopy of what was said to be a real photo postcard, a format designed to be easily sent by mail to friends or relatives. Like the only known (or suspected) photograph of the mother of the Adam brothers, the original is believed to have been lost.8 Despite the poor quality of this photocopy, it is apparent that the brothers have dressed sharply, with their hair neatly combed and several in ties, although this was apparently not such a formal occasion that they opted to wear jackets. It is also plausible that it was quite hot, if their reunion took place in the summer months, and the gentlemen may well have opted to be as comfortable as possible. 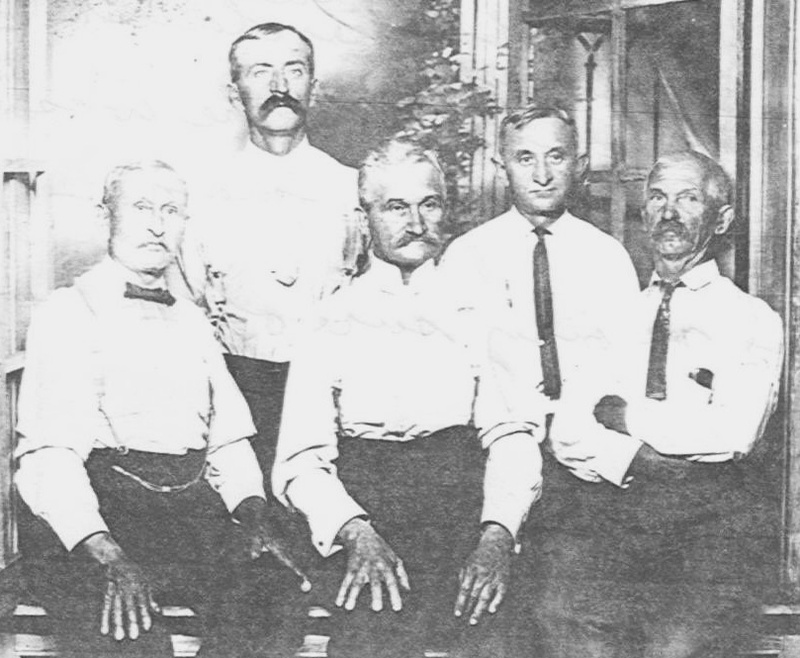 Several appear to wear sleeve garters, arm bands that helped to adjust the length of one’s sleeves.9 While the men’s appearances are distinct from one another, particularly given their disparate ages, similarly prominent noses—and, when visible, even hands—help to link them convincingly as brothers. This entry was posted in Photograph Analysis and tagged 1910s, Adam, Adams, antique photograph, Canada, family history, French Canadian, genealogy, immigrants, Iowa, Massachusetts, Quebec, real photo postcard, South Dakota, vintage photograph on January 19, 2018 by Melanie Frick. 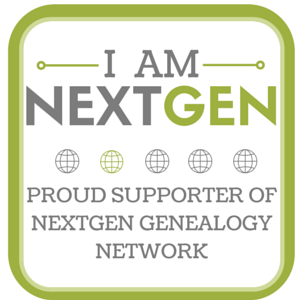 When Melanie (Lutz) Adam of Sioux City, Woodbury County, Iowa became a member of her local chapter of the Royal Neighbors of America as a newlywed in 1906,1 she could not have known how much her role as a Neighbor, as members called themselves, would define her adult life. Founded in 1888 as a social organization, the Royal Neighbors of America incorporated as a fraternal benefit society in 1895 and became known as one of the nation’s first insurers of women.2 Following the 1906 San Francisco earthquake, the Royal Neighbors of America developed a disaster aid program,3 and perhaps it was hearing about these worthy efforts that encouraged twenty-two year old Melanie to join later that year. Melanie (Lutz) Adam, in hat with dark sash seated center left, on a local outing with the Royal Neighbors of America, Sioux City, Woodbury County, Iowa, 1916; digital image 2010, privately held by Melanie Frick, 2017. Melanie (Lutz) Adam at Royal Neighbors of America retirement, Sioux City, Woodbury County, Iowa, 1959; digital image 2017, privately held by Melanie Frick, 2017. “You are to be congratulated […] for having accomplished, in good measure, what every person who does much thinking so very much wants: That is, to be remembered for something good they have done. Could you ask for more than – At the end of a cold, snowy day of driving in Monona County, as you drove home late and tired, to know that it had been you who had guided and influenced a young family in the start of a plan that has materially helped to educate their fine children? […] And perhaps that same cold day you had been responsible for the protection that later was the means of keeping together in the home a young mother with her children; because you had urged the young father that night to protect his family with Royal Neighbor insurance. “We could look into many homes in Sioux City and the counties around, where you find Neighbors to bless you for the little extra you urged them to save. This little, now added to their Social Security, makes the difference between a bare existence and many of the good things of life. 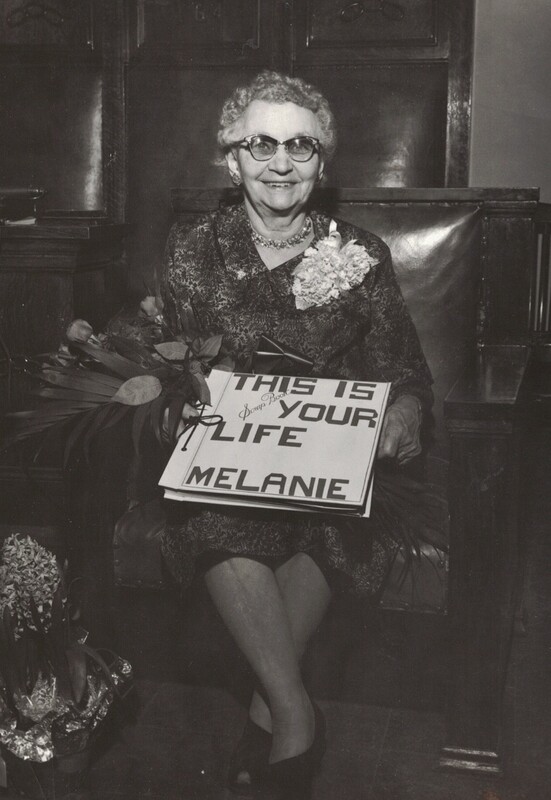 Although enrollment has dwindled in Sioux City, the Royal Neighbors of America remains active nationwide today, a fact that would certainly have pleased Melanie who had a profound appreciation for the friendships, leadership experience, and career opportunities she enjoyed during more than half a century as a Neighbor. Copyright © 2017 Melanie Frick. All Rights Reserved. This entry was posted in Uncategorized and tagged 1900s, 1910s, 1920s, 1950s, Adam, antique photograph, family history, fraternal benefit societies, genealogy, Iowa, Lutz, Royal Neighbors of America, Sioux City, vintage photograph on September 25, 2017 by Melanie Frick. Helena, Louise, and Andrea Nelson, Yankton County, South Dakota, ca. 1916-1918; digital image 2017, privately held by Melanie Frick, 2017. Pitching in to help out on the farm would have been the norm for the Nelson girls, the three middle children in a family of nine. 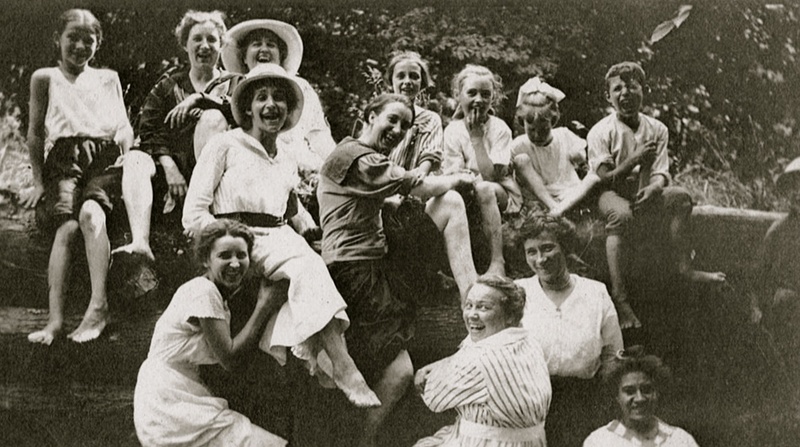 Helena’s daughter later recalled her mother’s stories of working in the fields in the summertime,3 and in a letter dated 1918, in response to a question from her cousin about taking summer courses, Andrea replied, “Oh, how I’d love to, but guess it’s chickens to tend etc. and overalls to wear. Suppose that too will be sport, but after all, is there anything like being a schoolgirl?”4 The Nelson girls would have been especially needed on the farm that summer, as their older brother, Ole, was in the service. While many decades had yet to pass before women wearing pants would become truly mainstream, I can’t imagine that it would have been unusual at this time for young women to wear the clothing most suitable for farm labor while at home among family. 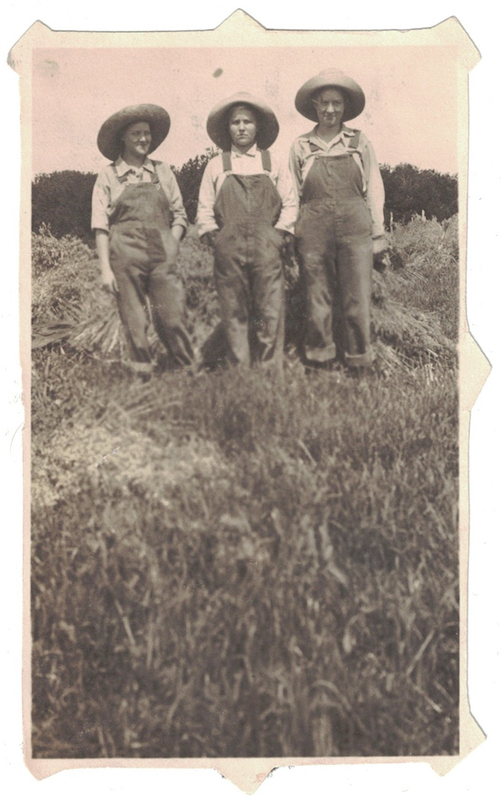 The overalls and loose collared shirts worn by the Nelson girls might have been hand-me-downs from their father and brother (even Levi Strauss & Co. didn’t begin to make jeans especially for women until the 1930s! ), and, positioned side-by-side in a field with wide-brimmed straw hats atop their heads, the sisters—or the photographer—clearly recognized that this was a photo op not to be missed. This entry was posted in Photograph Analysis and tagged 1910s, antique photograph, family history, genealogy, Nelson, South Dakota, vintage photograph, Yankton on August 28, 2017 by Melanie Frick. Farm kids have long learned to make their own fun, and Frances Marie Noehl of Deerfield, Chickasaw County, Iowa was no exception. 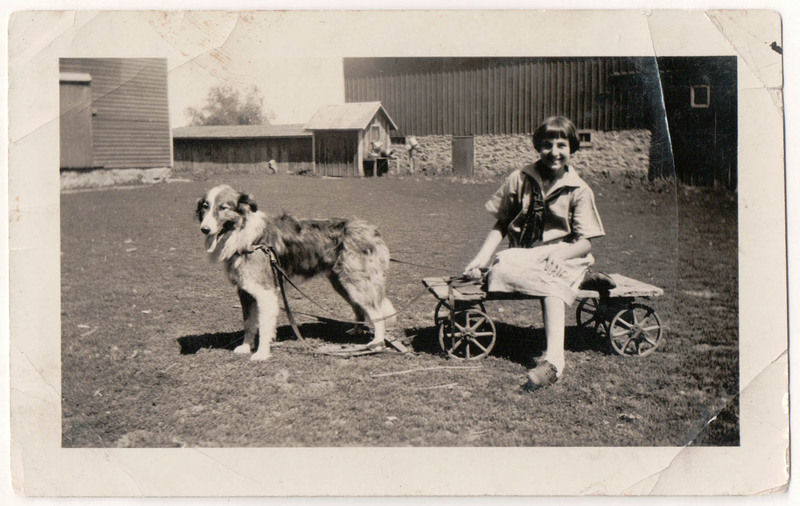 Pictured here circa 1920, Frances is grinning as she sits on a wooden cart pulled by her dog, Shep. If his expression can be interpreted, he appears to have been game to take part in the shenanigans of Frances and her siblings: Leo, Helen, Kathryn, Elinor, John, Al, Frank, and Joe. Frances, born in the spring of 1911, fell between Frank and Joe in age as the second-to-youngest of the nine children of German immigrants Mathias and Elizabeth (Hoffman) Noehl. Frances Marie Noehl with Shep, Chickasaw County, Iowa, circa 1920; digital image 2015, privately held by Valene Petersen, 2016. With her bobbed haircut and loose-fitting, short-sleeved cotton dress, complete with a tie about the neck à la a sailor suit, Frances looks every bit an energetic 1920s tween.7 Her worn leather shoes appear to be barely staying on her feet and she sits relaxed with one bare (or stockinged) leg folded underneath. A massive barn with a stone foundation is visible behind her. This informal snapshot was likely taken by a family member, although since I have seen very few photographs of the Noehl family in general, I wonder if photography may have been only a passing hobby. In any case, it’s a pleasure to have a rare glimpse into a long-ago childhood. Copyright © 2016 Melanie Frick. All Rights Reserved. This entry was posted in Photograph Analysis and tagged 1910s, 1920s, antique photograph, family history, genealogy, Iowa, Noehl, vintage photograph on March 28, 2016 by Melanie Frick.